Ulcerative Colitis is a condition characterized by DIARRHEA, BLOOD AND MUCOUS in stools and PAIN while passing stools. This gradually leads to weakness and anemia. 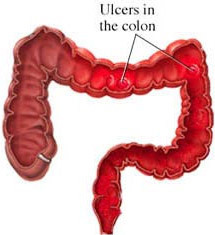 The ulcerative colitis is characterized by ulceration of the inner lining of the large bowel. There are numerous ulcers and the extent of ulceration varies from patient of patient. The correct diagnosis is the 1st step to right treatment. All patients with blood in stools and diarrhea are not necessarily suffering from ulcerative colitis, which has to be differentiated from other diseases. COLONOSCOPY is performed to arrive at the correct diagnosis. Ulcerative Colitis follows a prolonged course with periods of activity ( relapse) and inactivity ( remission). A majority of the cases respond to medical treatment and do not require surgery. Patients diagnosed with ulcerative colitis should be on a regular follow up. If the disease is MORE THAN 10 YEARS old and has involved the whole of the colon then chances of COLONIC CANCER INCREASE. These patients should be REGULARLY SCREENED for the same.